It is normal to want to stand out from the crowd. The feeling of wanting to attract a few eyes to your direction is not unique to you; it is a sentiment you share with everyone. However, as you have the same thoughts, it becomes harder to stand out, because everyone will do their best to stand out. One way to stand out effectively is to wear eye-catching accessories, the likes of glowing necklaces. Their luminescence is more than enough to make people take a quick second look at you. Glowing necklaces easily attracts more eyes than a pair because they glow. It is not every time that a body accessory emits a light, a beautiful one that can give you a calm sensation as you lay your eyes on it. There are many designs available in the market, each of them with an appeal unlike any other, and so definitely you will find one that you will like. Most glowing necklaces are pendant necklaces which have glowing stones in the pendant. There are also a fair few of them which are items applied with glowing powder. No matter which glowing necklaces tickle your fancy, we’re here to scour the market for the best ones! Many fairy tales and stories have associated the moon as a romantic symbol, and these glowing necklaces certainly embody that ideal. 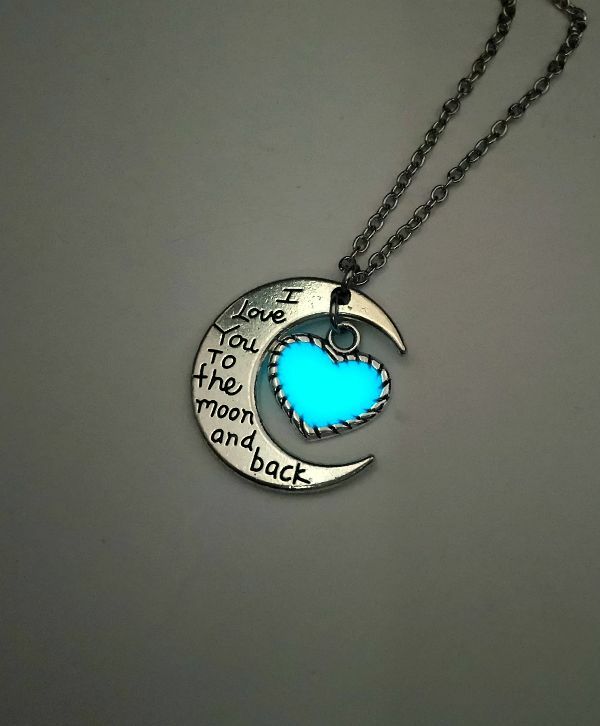 They have an adorable quote etched to the waning moon that serves as a standing promise of true love, an attempt to measure something immeasurably big. The heart pendant glows as a show of the fervor of that love. Together, these necklaces are more than a great steal; they’re an insignia of love. Continuing the romance of the satellite from the necklace above, the Eye-Catching Luminous Moon Pendant Necklace indeed captures the beauty of the moon in a purer form. Wearing the moon that shines brightly on the night sky, it gives you a connection to the serene blanket of darkness at night. Their glow also comes in many hues, so you can color the light of the sweet moon with the one that reflects you the most. The horse represents freedom, the kind that you will feel as you ride these majestic creatures. They glow turquoise, with a presence in the dark so strong and fierce that shows your deep passion. The pendant displays the fine artisanship used to craft it into one of the most exquisite pieces in the list. One of these glowing necklaces is sure to look great on any ardent style you don. The exceptional pendant takes inspiration from Irish designs, wrapping the glowing stone in intricately crafted swirls. The yellow stone shines brightly in the dark, like a twinkling star in the night. In a room where there’s little light, you are sure to glow differently. They can even be great as a gift for the holidays! Don’t be afraid to wear your heart out on these glowing necklaces! Connect to the depths of the blue seas with these glowing necklaces. 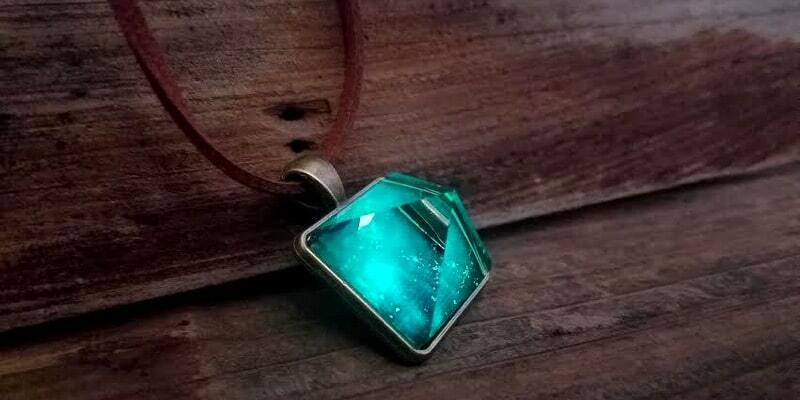 Unlike other glowing accessories, this pendant needs to be charged by exposing it to light. 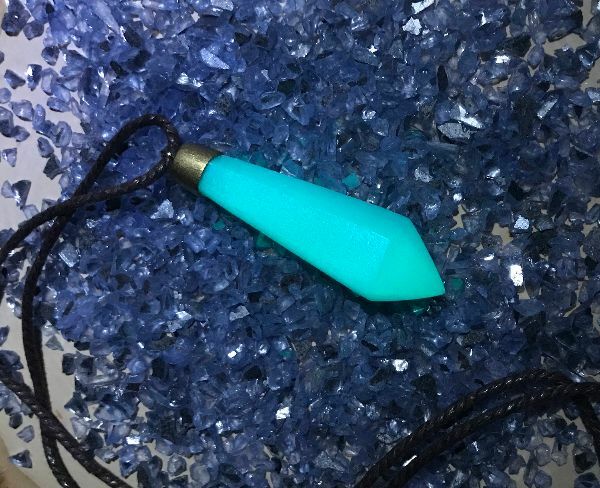 It is also handcrafted using silver-plated findings and top-notch glow in the dark powder, giving it the aqua glow that reflects the color of the ocean. This is a perfect necklace for the sea lover, who wants to feel the essence of the waters no matter where they may be. If you want to have the ocean around your neck but you want something more adorable than the one above, then the Glow in the Dark Dolphins Necklace is the one for you! 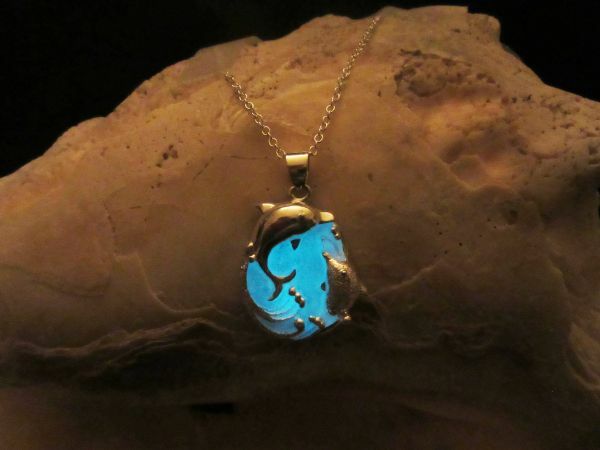 The cute pendant is made of sterling silver, in a way as if the dolphins are swimming inside a glowing bubble of blue. 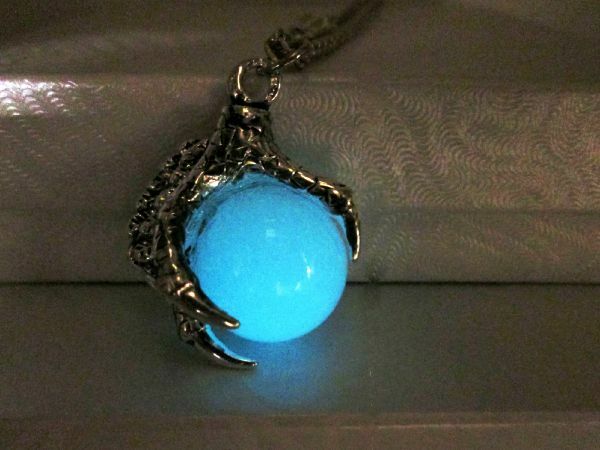 Similar to the necklace above, it needs to be charged with light so that it will glow in the dark. But even without its aqua shine, the necklace looks adorably stunning. If you are in touch with your fairy tale self and feel a connection not with the princess but with the chivalrous prince, then these Dragon Class Glowing Necklaces are the excellent match for you. The silver dragon claw reminds you of the famous dragons slain by brave princes, showing a roughness that even men will like. The ball is pale green in the daylight but glows blue in the dark, attracting anyone nearby. It’s possible to preserve your beloved flowers inside resin, but what if you could sweeten the deal by making them glow, while you’re at it? 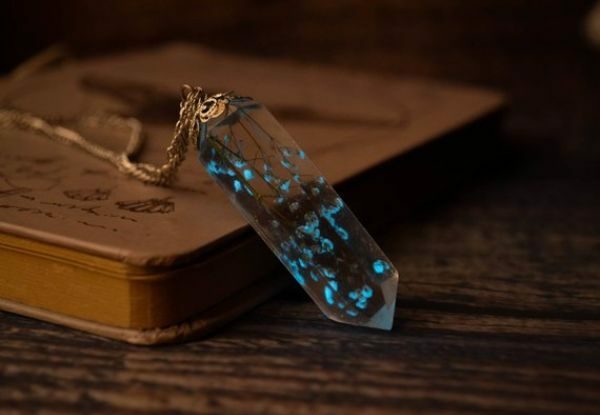 The Real Flowers Resin Glowing Necklaces let you have real dainty flowers glowing a beautiful blue light. Stored inside a hexagonal prism of resin, the flowers need to be charged with light and then they will glow once they’re in the dark. The Glowing Paw Pendant Women’s Necklaces are those who love their pets so much! The glowing stone is kept inside the paw pendant, making for an adorable package that will show your profound affection for the critters possessing these paws to everyone. These glowing necklaces are different from the others in this list; the glow of these necklaces comes from a pulsing LED light inside. 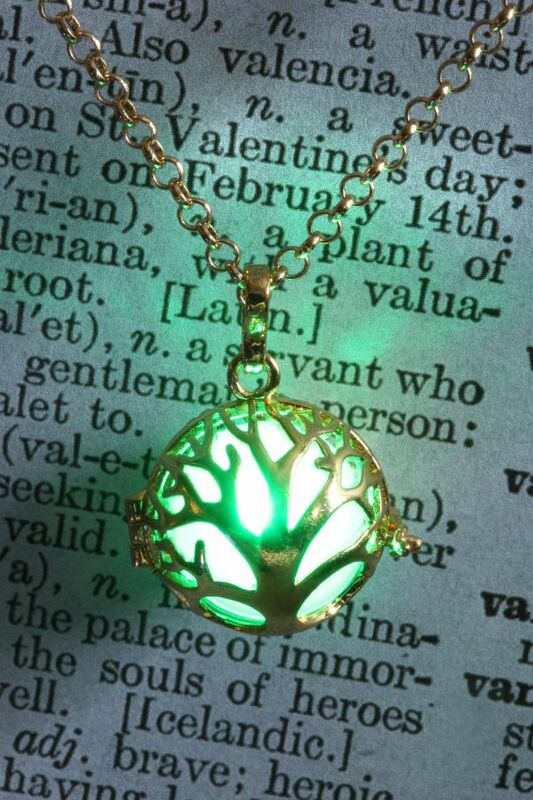 The LED fades on and off, replicating a twinkling effect as it stays inside the golden Tree of Life locket. The great thing about these necklaces is that you can freely choose if you want them to glow or not, plus the batteries are replaceable. It even helps that the locket looks great without the glow effect, too! The elegance of the design of the cubic pendant does not go unnoticed; the fine handiwork is too exquisite to not talk about. But at the hours of the night, the true beauty of the necklace shows as the stone inside the dainty locket glows brightly. Now, this is something that everyone will have a hard time peeling off from. These glowing necklaces shine as magical as the land of Atlantis from which they got their name. The aqua blue crystal glows beautifully for as long as 8 hours when charged in direct sunlight. Handcrafted with care, the glow of the necklace reminds you of the deep waters that calm you with mystical energy, much like the mystery of Atlantis. 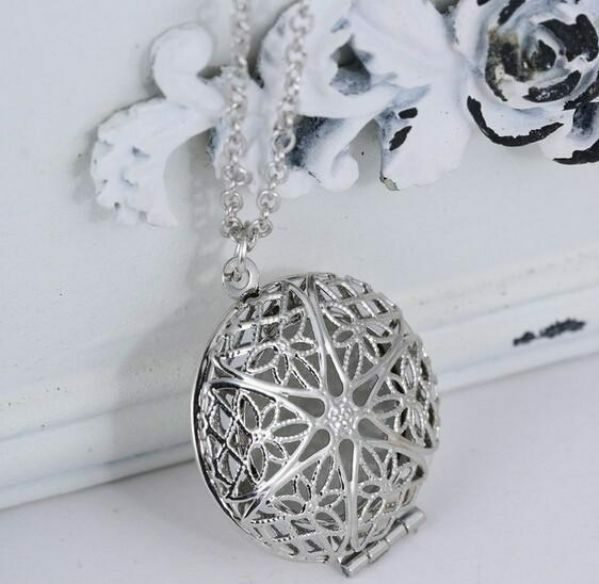 Most people say, “Wish upon a star”, a fleeting object that doesn’t last for long, but we say “Wish upon this gorgeous glowing necklace!” Inside this wishing ball are real dandelion seeds. People wish on dandelion seeds because they are said to send your thoughts to your loved ones and even grant them. Being able to store them in a ball can let you keep your wishes with you, and they glow beautifully, much more beautiful than the shooting stars above! We have a strong attraction to the celestial objects above, but with these glowing necklaces, we now have a way to keep them close to us. The moon has always been a beautiful thing to us, with its moonlight glimmering in the night. To have that same beauty hung on our necks, well, it can only do one thing to us: make us, at the very least, as pretty as the moon. On any other time, the Ornate Incandescent Pendant Women’s Necklace looks like a normal yet gorgeous necklace. But on the onset of the dark, the necklace shows its true magnificence; the stone inside glows and shows off the intricate design of the pendant. It’s a dainty and elegant addition to a ball gown or even to a casual get-up, and its turquoise glow will definitely attract people. The glowing necklaces trend might have been inspired by the rise of glowing sticks in the ’90s, although jeweler Tom Binns argues it is not. As he popularized resin pendants shining with glowing powder, he says that he is modernizing fluorescent colors with glamorous necklaces. Indeed, it has become a gorgeous trend, with many women shining with the lights of the night. As Binns has said, women like these kinds of necklaces because these glowing necklaces make them shine. ﻿ The list features gorgeously beautiful glowing necklaces, but you can go ahead and make your own! There are many kinds of glowing necklaces, like the ones in this list which have glowing stones inside locket pendants. However, we’re going to teach you how to make one out of resin! Prepare design and have it printed in and cut from a transparent film. For this tutorial, we’ll use a circular cat design. Make a mold for the pendant which can fit the cut design. In this case, we can make a mold from cut plastic pill bottles with scotch tape, then closed off possible holes with hot glue. Make a mixture of epoxy resin and glow powder. You can buy clear-casting epoxy resin and glow powder from Amazon, eBay, or other online resellers. You can also find them in craft stores. Follow instructions on how to mix the epoxy resin, and pour in the powder later on. Pour the mixture into the mold, then put in the design. Sandwich the design with the mixture, making sure that the mixture doesn’t spill and completely covers the design. Let it sit for 48 hours or until the mixture is rock-hard. After this, you now have your glowing pendant! You can smooth the pendant with sandpaper. Using a metal wire, fashion a holder for the pendant. In this tutorial, we will make a cat-inspired holder for the pendant using metal wire and solder. As a finishing touch, grab any string and make a necklace for your pendant. And voila, you now have a glowing necklace! Glowing necklaces are a quickly growing trend, almost similar to the increasing popularity of couples jewelry, that’s surely taking off. The beauty of these dainty pendants splendidly shining as they dangle around your neck is such an attractive thing to look at, especially during the nighttime. They glow in times when it’s hardest to stand out, and when you do catch everyone’s attention with it, you’ll look definitely look like the stars above. Their glowing charm is their greatest leverage because once they light you up, they’ll unequivocally light up others, too! However, if too much luminescence is not up to your alley, you can try and take a look at rose gold necklaces and see if you can find one that fits your fancy.